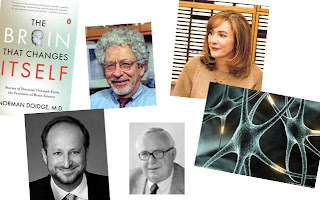 I was surprised by how interesting I found The Brain That Changes Itself: Stories of Personal Triumph from the Frontiers of Brain Science (James H. Silberman Books) (see my earlier post). It grabbed my interest right away with a description of the work by Paul Bach-y-Rita a great pioneer in the field of the neuroplasticity. He has demonstrated many times the process of SENSORY SUBSTITUTION: when one of our senses is damaged, another one can sometimes take it over for it. Bach-y-Rita claimed that any part of the cortex should be able to process whatever electrical signals were sent to it and that our brain modules are not as specialized as we have long thought at all. There are different types of application of the principle of sensory substitution. For instance, Bach-y-Rita has provided people with devices that deliver sensory information to the brain so that they regained there senses (for instance sight). Another example is, when a certain part of the brain is damaged, to lead sensory information to another part of the brain and let that part process that information (for instance to led visual sensory input be processed by the auditory cortex). Chapter 2, Building herself a better brain is perhaps the most inspiring chapter of the book. It is the story of Barbara Arrowsmith Young. As a child she suffered from a brain dysfunction. The part of the brain that helps us understand relationships between symbols did not work well. The chapter tells about how she struggled to perform normally and how she eventually invented a treatment that helped her overcome her cognitive difficulties. After that, she has developed many specific exercises for each of the 19 brain areas that under-perform in people with learning disabilities. Then the book moves on to another pioneer of the field, Michael Merzenich, who has made many important contributions. Through a series of experiments he proved the plasticity of the brain. It was interesting to read how his research was not taken very seriously at the time but is now, a few decades later, considered the norm. One of the important points made by Merzenich is that paying close attention is a prerequisite to long-term plastic change. The findings by Merzenich and his colleagues have many practical implications. One is that we may improve and maintain memory at old age by actively staying in a learning mode (for instance by learning a new language) so that our control system for plasticity stays in good shape (read the chapter for the details). The rest of the book also contains some very interesting material but the first three chapters were the best according to me. The least convincing and interesting part I found the part about Freud, but maybe that says more about me than about the book? All in all, I highly recommend this book. More and more, a hopeful perspective on human development is emerging. Our characteristics are less carved in stone than we tend to think. Dysfunctions are often less definitive than we have long thought. We can consciously keep on developing our brain and our functioning in general. And we do. Everything we do and think shapes how we further develop. Every time we consciously focus our attention, we change structurally. Just think of the possibilities. Yes, the possibilities—and also the responsibility we have to our attention. It is an amazing tool. Laurence Freeman said something like: "We are disciples to what which we give our attention." "Wherever your attention is, this is what you love," Gangaji said. And I tell my students and clients, "Attention is the road your mind walks down." Quite right about the responsibility part. Thank you for adding that Stephanie. "What we pay attention to, and how we pay attention, determine the content and quality of life."